A facelift is a commonly performed cosmetic procedure that will remarkably improve your look by restoring a more youthful appearance to your face and neck. The procedure is designed to restore a sagging jaw-line (jowels), hanging neck, and falling cheeks. There are many methods of performing facelifts (see below), with significant advancements made over the past 10 years. Dr. Steiger’s advanced facelift techniques are customized to your face. He strategically repositions the deeper tissues, placing no tension on the skin. This produces a natural appearing facelift result. The goal of facelift should be to restore your youthful appearance rather then make you look different. The result should appear natural. As a plastic surgeon dedicated to the face, Dr. Steiger is skilled at and performs the most advanced types of facelifts in order to achieve this result. He will carefully analyze your specific aging pattern in order to determine the most effective way to rejuvenate your face and the most appropriate facelift for you. The right type of facelift will produce a natural , long lasting result. Dr. Steiger performs all facelift procedures at his state of the art medical and surgical facility located in Boca Raton, FL. To remove jowls and wattles for a more refined jaw, smoother neck and contoured cheek. All incisions are hidden within the hair and/or existing facial creases. The type of facelift performed is custom tailored to each individual patient (see types of facelifts). This is determined after a thorough discussion, facial analysis and examination; evaluating your desires, unique facial structure, anatomy and specific pattern of aging. A facelift takes between 2-4 hours to perform, depending upon the type of lift. It is performed in our state of the art, fully accredited outpatient surgical facility or at the hospital. Other plastic surgery procedures can be combined with a facelift, and may be recommended after a detailed consultation with Dr. Steiger. Recovery time ranges between 1-3 weeks. 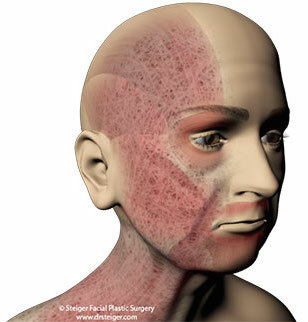 Facelift sutures will be removed 1 week after your surgery. Depending on your type of work, you may return as early as 1 week. Full, strenuous physical activity should be avoided for 2 weeks after the procedure. Bruising can occur after surgery, which may be camouflaged with makeup. This generally resolves after 2 weeks. Most patients do not experience any real pain after surgery, but describe a discomfort from the feeling of tightness. We will prescribe analgesics to help alleviate this. Absolutely! The best facelifts look completely natural. They do NOT look pulled or stretched. Dr. Steiger uses the most advanced facelift techniques in order to achieve the most natural and best facelift results. Using his extensive understanding of the facial aging process, Dr. Steiger can help you achieve a more rested, youthful appearance while maintaining your natural appearance. The goal is for you to look like a more youthful version of yourself. 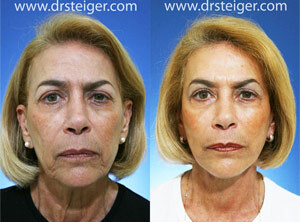 Dr. Steiger uses the most advanced and proven facelifting techniques to achieve this goal. View some of our deep plane facelift before and after photos to see some of the amazing results that can be achieved. Continue to read this page in order to learn about facelift surgery and what makes Dr. Steiger’s methods so unique. In order to best understand what a facelift does, we must first understand the facial aging process. As we age, the face and neck go through a transformation. A very young face is oval or round in appearance. We see this is children and young adults. A young face is much fuller than an older face. The first signs of aging are often seen through the loss of fullness (volume) in the face. This loss of fullness occurs throughout our lives, but reaches a point where the “baby fat” is lost and the face appears less oval/round and more heart shaped. This is the point where most people like their facial appearance most. It is often in a person’s 30’s. Unfortunately, aging does not stop at that point. As the aging process continues, we continue to lose the fullness in our faces. In addition to the loss of volume, the structural integrity of our face (see below) begins to sag to the point where it becomes more noticeable. This is often first seen in your 40’s. The ligaments that hold up the cheeks weaken and make the loss of cheek fullness appear more prominent. Our face also has ligaments that hold up facial tissues above the jaw line. As these ligaments get weaker, the jowls begin to form causing the jaw line to appear less defined. As we continue to age into our 50’s and beyond, the jowls continue to fall, and the neck begins to fall down with it. As the cheeks, jowls and neck fall our faces begin to look more square or rectangular, instead of a youthful heart. The best facelifts specifically treat the structures of the face that have sagged and helps to restore more of a heart-shaped appearance to an older/rectangular face. Does everyone age the same way? No! The described progression is a generalization of the aging process. Facial structure, genetics, and extrinsic factors (exposure to the elements) affect each person differently. Part of the consultation process with a facelift specialist is designed to specifically evaluate your needs. This is why it is so important to consult a facelift surgeon who is experienced with this surgery and who has the artistic eye that can create the most natural and effective resutls. Dr. Steiger’s facial rejuvenation approach is designed and customized individually for each patient. While the basic principles are similar, the plan varies from person to person. Are all facelift procedures the same? Skin only facelifts – The skin is lifted up and tightened. These facelifts should not be performed today because they do not last unless the skin is over-tightened. This can result in a pulled and unnatural look. SMAS facelifts- This is one of the most commonly performed facelift surgeries. Popularized in the 1970’s and 1980’s, SMAS facelift surgery involves lifting and tightening the SMAS layer (muscle layer). This is often performed close to the ear, further away from the jowl. This is the most common form of facelift surgery with many described variations. Extended SMAS facelifts- In this facelift the SMAS is dissected further into the jowel and neck, releasing some of the facial retaining ligaments of the face. Releasing the ligament and repositioning it into it’s more youthful state can result in a more effective lift. Deep Plane Facelift- The deep plane facelift is one of the most advanced facelift techniques available today. It is a step beyond the extended SMAS facelift because the cheek ligament (zygomatic) is also released. Releasing the cheek ligament allows the malar fat pad (cheek fat) to be restored and lifted into its more youthful position. The cheek, jowel, and neck ligaments are all released and restored. This rejuvenates the face into a more heart-shaped appearance. This leads to the most effective and natural facelift results. What is the “muscle layer” of the face? The muscle layer of the face is commonly referred to when describing the SMAS. SMAS is an acronym for the Superficial Muscular Aponeurotic System (SMAS). The SMAS is a sheet of fibrous tissue beneath the skin, that extends from the very top of the head, down to the collar bones. The SMAS surrounds the face and neck 360 degrees around. The SMAS is often referred to as the muscle layer of the face because the SMAS layer also covers some of the muscles of the face and neck. It technically is NOT a layer of muscle. Just the strong fibrous band that invests many of the facial tissues, including some of the face and neck muscles. 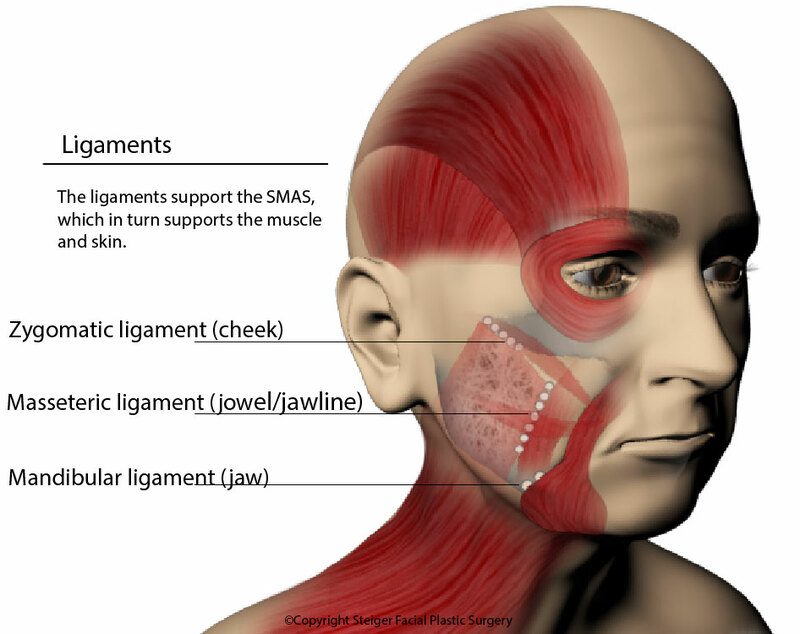 An illustration of the SMAS layer of the face. Notice how the fibrous SMAS tissue envelopes some of the face/neck muscles, and surrounds the entire face and neck. What are the ligaments of the face? The face has several retaining ligaments. They help the face keep its shape. As we age, the ligaments get loose and the facial tissues start to fall. These ligaments begin to relax as soon as in our 30’s. The cheeks, jawline and neck all sag and droop as the ligaments begin to relax. A deep plane facelift is one of the most advanced facelifting methods performed today. This technique specifically focuses on releasing and repositioning all of the facial ligaments in addition to the SMAS layer. Since you are treating the problem at its very cause, the deep plane facelift can lead to the most effective and natural facelift results possible. Do you perform the Deep Plane Facelift? Yes. 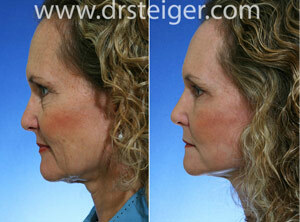 Dr. Steiger has been performing and innovating on the Deep Plane Facelift for over 10 years. It is one of the most advanced facelift surgeries available today. 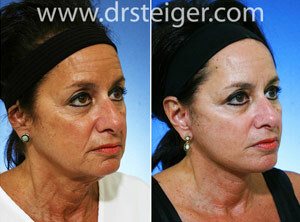 Dr. Steiger’s Deep Plane Facelift can ensure some of the most natural and effective results. Patients from all over South Florida, New York, Chicago, California and around the world have come to visit Dr. Steiger for a facelift in Boca Raton to benefit from his advanced facelift surgery techniques. What is the recovery like after a Deep Plane Facelift? The deep plane facelift recovery is very similar to the recovery from any other SMAS facelift surgery. In fact, most of our patients go home after surgery and do not stay in our overnight patient recovery rooms. Where are the facelift incisions made? 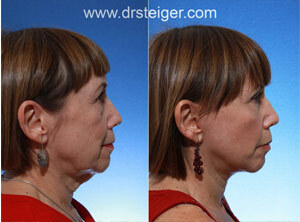 Dr. Steiger will hide your facelift incisions in such a way so that they are well concealed . The incisions are hidden within your hairline, inside the ear, and behind your ear to best camouflage them. The extent of the incisions is based upon your unique aging pattern that will be explained to you by Dr. Steiger. All facelift incisions are generally similar no matter what technique is used. The difference in facelift surgery is based upon what is done under the skin. What anesthesia do you use for facelift surgery? 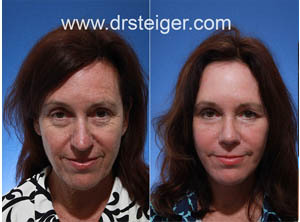 Dr. Steiger performs facelift surgery under deep sedation (twilight sleep) anesthesia. This type of anesthesia will have you sleeping throughout your facial rejuvenation surgery, but does not have the side effects commonly seen from the heavy doses of medication needed for general anesthesia. Anesthesia at the Steiger Facial Plastic Surgery center is administered by a board certified anesthesiologist. Our Boca Raton Facelift facility is fully accredited and adheres to the highest standards of quality and safety. Other forms of anesthetic are available if preferred and can be discussed with you during your facelift consultation. Dr. Jacob D Steiger MD is a South Florida Facelift specialist board certified by the American Board of Facial Plastic and Reconstructive Surgery and the American Board of Otolaryngology- Head & Neck Surgery. 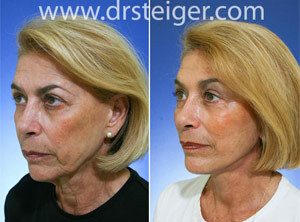 Dr. Teiger performs the most advanced facelift procedures available in our Boca Raton facelift center. He practices in Boca Raton and Delray Beach, Florida treating patients from Palm Beach, Ft. Lauderdale, Miami, as well as patients from all over the US and from around the world.